Shaquille O’Neal's 28-room lakefront mansion near Orlando is for sale and featured this week at TopTenRealEstateDeals.com. Shaq’s massive Lake Butler estate within the private golf community of Isleworth, about 20 minutes southwest of Orlando's resorts and amusement parks, is sized to feel spacious to a man of 7’1” weighing in at 325 pounds. Completely customized to fit his varied lifestyle, it is not surprising that one outstanding feature is an indoor 6,000-square-foot basketball court with bleachers. Unusual extras include two garages that together will fit 17 cars, one a show-car garage with fitness center and the other having a dance studio and an enclosed recording studio, recalling his rap music hits of the 1990s. Measuring in at 31,000 square feet and spread across the entire three acres, Shaq's mansion includes 12 bedrooms, 15 baths, chef’s kitchen with Viking, Wolf and Sub-Zero appliances, massive living room, formal dining, media room with bar and a “gentleman’s room” with game tables, and wet bar. The master wing has a bedroom with Shaq's custom 15-foot round bed, a four-room closet and his-and-her baths. The guest wing has its own great room with bar and five ensuite bedrooms. Some unusual rooms include a temperature-controlled, cedar-planked humidor and wine storage and an aquarium-style room with saltwater triangular fish tank. Most impressive is the wall mural of a true-to-size tractor trailer barreling toward the interior of the room on an expressway. With the front cab bumped out of the wall, the realism is electrifying. The grandeur doesn’t stop with the interior. Shaq nicknamed his party-perfect outdoor area “Shaq-apulco” quite aptly. The 95-foot long swimming pool seems to go on forever and has a large waterfall spilling over boulders. It includes a swim-up bar and a spa large enough for a crowd. The pool deck also has an extensive outdoor kitchen, all of which looks out over Lake Butler, the long private pier with boathouse and the life-size statue of Shaq’s favorite character, Superman, standing at the end overlooking the lake. Shaquille O’Neal - a big man with a big personality and stellar basketball career, is selling his equally large estate with a personality to match his own. His custom-designed home overlooking Lake Butler outside of Orlando, Florida where he has lived since 1993 is now on the market, priced at $28 million. The listing agent is Danial Natoli of Premier Sotheby’s International Realty in Orlando, Florida. Visit TopTenRealEstateDeals.com for more historic, spectacular and celebrity homes and real estate news. Landmarks Illinois >> Preservation Award Nominations Due in 1 Week! Landmarks Illinois is taking nominations for the 25th Anniversary of our Richard H. Driehaus Foundation Preservation Awards! The annual awards program honors individuals, organizations and projects that demonstrate a commitment to historic preservation. Make sure to read the nomination guidelines below before submitting your nomination! An effective local or statewide campaign to preserve and protect a historic resource. Individual, municipality, private organization or joint partnership that has championed historic preservation, planning, or public policy. Projects that make possible the continued use of a historic commercial/industrial, residential, or public/institutional structure. An elected official who champions historic preservation policy, programs and funding and/or financial incentives recognizing the importance of preserving Illinois' heritage. Award recipients will be honored at a ceremony taking place Saturday, September 15, 2018, in Chicago. In addition to the award itself, each winner will receive a $1,000 cash prize. MORE DETAILS ON THE AWARD CEREMONY COMING SOON! Outside alcohol will be allowed at the other 70 public concerts and programs happening in Millennium Park this summer. Visitors will have additional food and beverage options at various price points available for purchase inside the venue. Subject to bag search at the security perimeter, guests will continue to be allowed to bring their own food and non-alcoholic beverages to all events at Millennium Park. Please be patient and plan ahead for the Millennium Park Security Perimeter. Knowing what items are prohibited will help speed your bag check. Entry may be faster for those without bags. For more information about the new security measures, including a full list of the prohibited items, visit millenniumpark.org. Upscale Breakfast restaurant and bar in Lakeview area of Chicago seeking staff for June 21st opening! A new upscale breakfast restaurant and bar will be opening in the Lakeview area of Chicago on June 21st. Pancake Cafe, 3805 n. Broadway at Irving is looking to hire servers, cooks, head cooks, bussers, managers, bar managers, bartenders, hosts. Forty artists and photographers will be selected! The selected winners receive one print up to 24x36 on museum quality paper to be shown in an international group exhibition in our gallery. The show will be widely promoted and will include a reception for the artists. Multiple entries are permitted, separate entry fee required for each set of three images submitted. File uploads are the only accepted submissions maximum of 3MB each. Please do not send materials to LACDA. All materials sent to LACDA will not be viewed and cannot be returned. LACDA announces an open call for our juried competition featuring digital art and photography. Entrants submit three JPEG files of original work. All styles of 2D artwork and photography where digital processes of any kind were integral to the creation of the images are acceptable. This call is international, open to all geographical locations. Forty winners will be selected. The selected winners recieve one print up to 24x36 on museum quality paper to be shown in an international group exhibition in our gallery. The show will be widely promoted and will include a reception for the artists. All entrants will be notified by email. No phone calls, please. Winners will be asked to FTP high resolution files to the gallery for printing. Registration and submission are done through our web site only. File uploads are the only accepted submissions maximum of 3MB each. Please do not send materials to LACDA. All materials sent to LACDA will not be viewed and cannot be returned. Images up to three megabites in size. Winners will be asked to provide high resolution images for final output. Entrants may be asked to provide more examples of their work and more detailed descriptions for consideration. All artwork will be offered for sale. Gallery retains 50% of all sales. Winners retain ownership of all unsold works. All artwork remains the intellectual property of the winner. Winner agrees to allow use of their images for promotional purposes only. Los Angeles Center For Digital Art is dedicated to the propagation of all forms of digital art, supporting local, international, emerging and established artists. 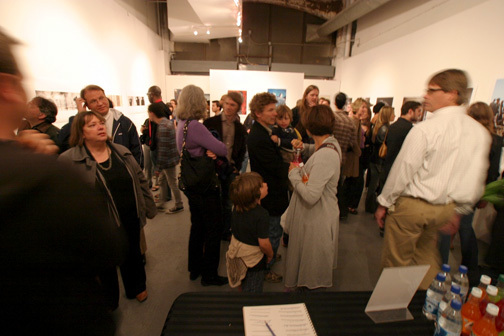 We have an ongoing schedule of exhibits and competitions, and produce editions of wide format archival prints. Works of individual artists remain the intellectual property and are copyrighted by their respective authors. No unauthorized reproduction, all rights reserved.